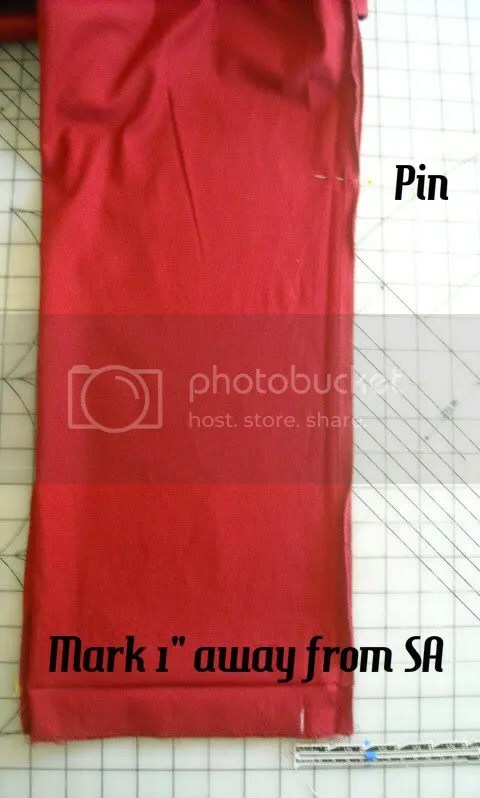 As promised, here’s the tutorial for tutorial for how I did my red pedal pushers in my last post! Pedal pushers are such a chic and casual vintage garment, and it is so much easier to refashion an existing pair of pants into this style, than it is to start from scratch. 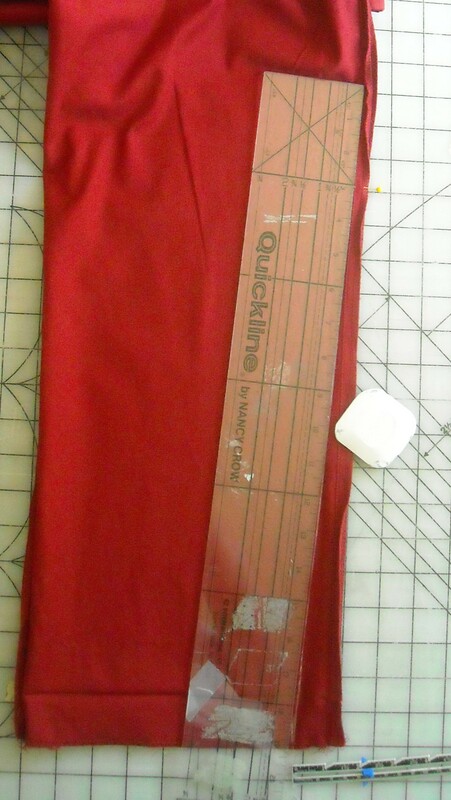 For this refashion, you will need: a ruler AND hem gauge, shears, thread scissors, thread, pins, and a pair of pants that fits you (mine are a pair of Banana Republic stretch cotton sateen ones that I thrifted). Start by trying on your pants. I recommend using a mirror for this next step, as you are going to want to find the place where the pants begin to get wide (usually this is right around the knee area, where the pants begin to taper out from a more-fitted thigh). Mark this area with a pin. Next, go all the way down to the bottom of the pants and pinch out all the excess fullness with your hand (don’t pinch too tight! You don’t want to cut off your circulation), and measure how much extra width needs to come out. For me, this number was 4″. 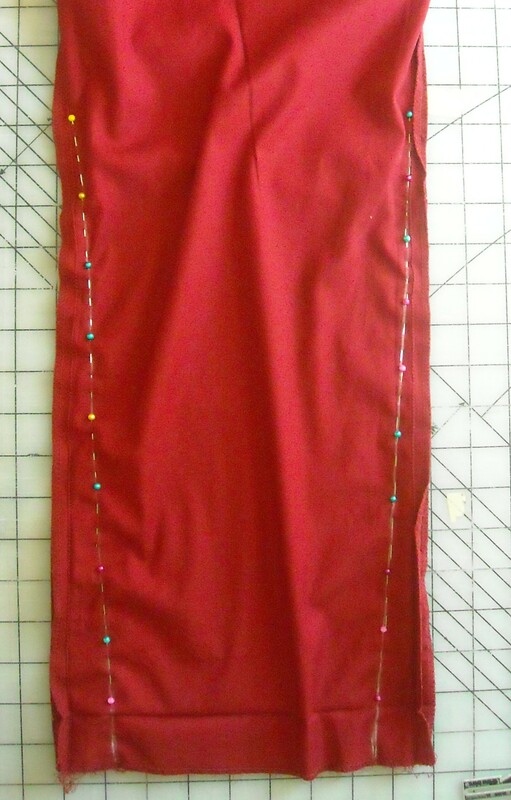 Take the pants off, measure how far up from the bottom you put that pin, and turn the pants inside out. 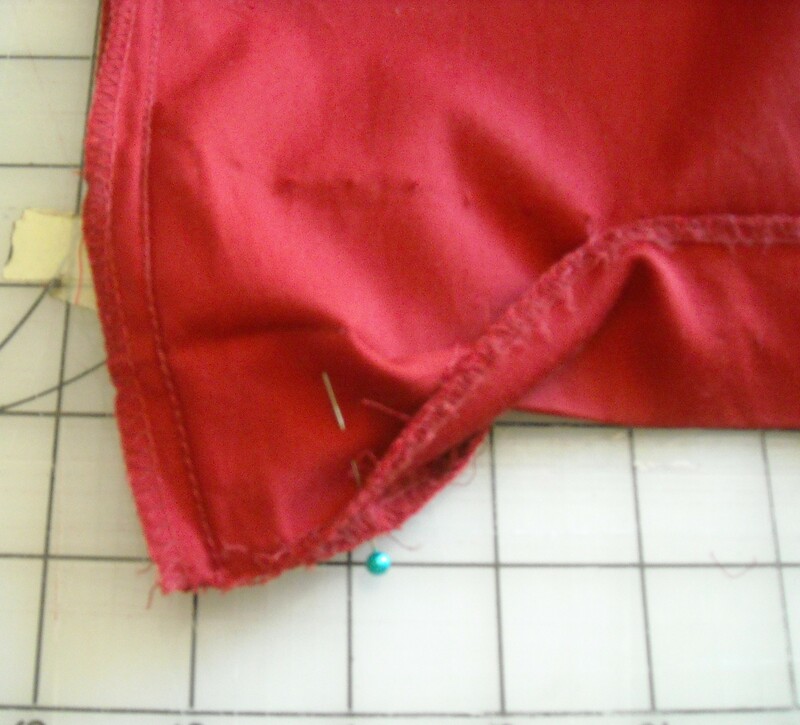 Place the pin back on the inside of the garment. 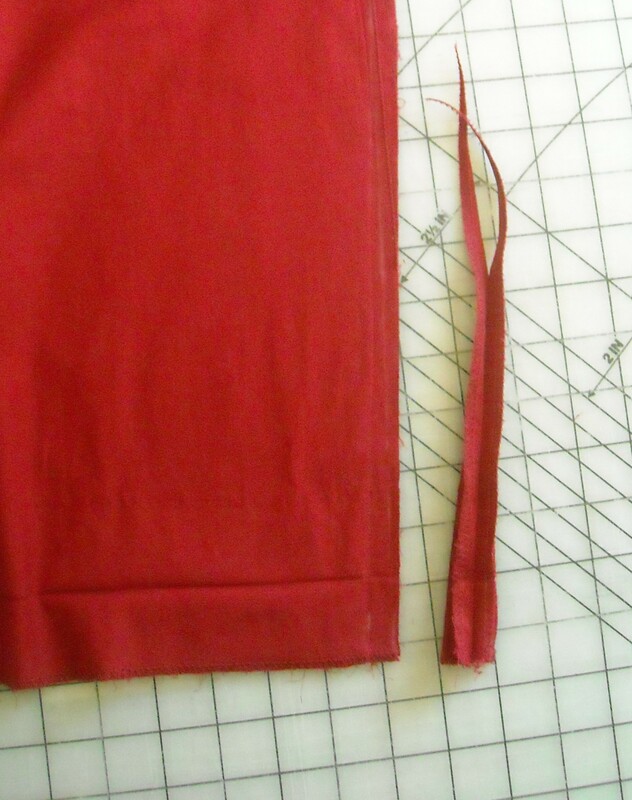 Next, use your seam ripper to rip out the hem. You also want to make sure that your seam allowances are able to lay against one another, so rip out the stitches that are causing them to lay flat. Please ignore the pin! I don’t know why that’s there . . .
Now, it’s time to do some math (I promise it’s easy, though!). You’re going to divide how much extra width to take out of your pants by 4. As you recall, my number was 4″, so 4/4 is 1, meaning that the new seam is going to start 1″away from the old seam. Smooth out one side of your pant leg (you can use an iron if you need to) and mark 1″ away from the side seam at the very bottom of the pants. I used tailor’s chalk for my mark, since it comes out easy. Next, using a long ruler, you are going to draw a connecting line from the pin at the top to the mark at the bottom. It should look like a triangle/dart. Place pins all along this line. 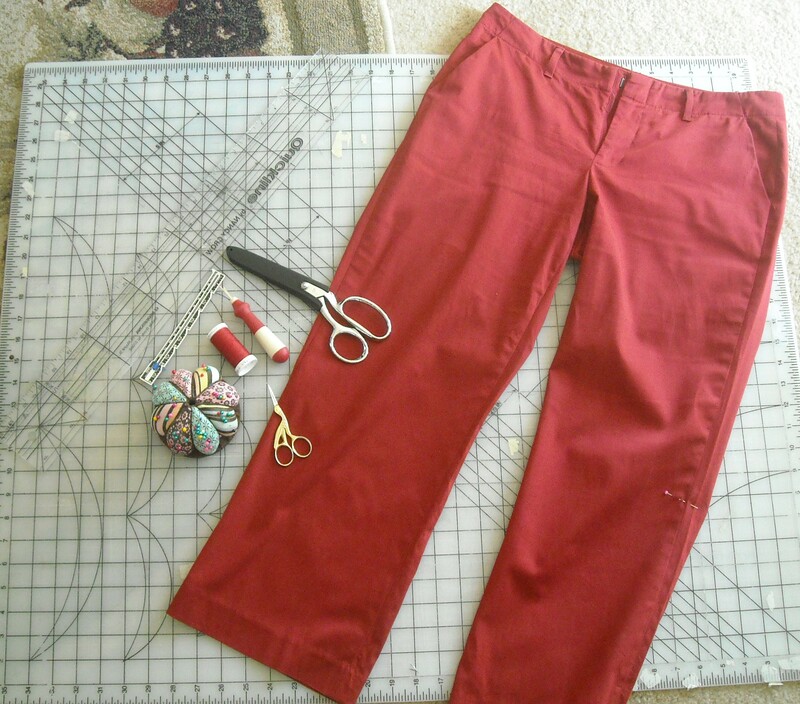 Once you’re satisfied with the fit on one leg, repeat the process on the other pant leg. Stitch along the lines that you marked. Use your favorite seam finishing technique to finish the raw seams you now have. 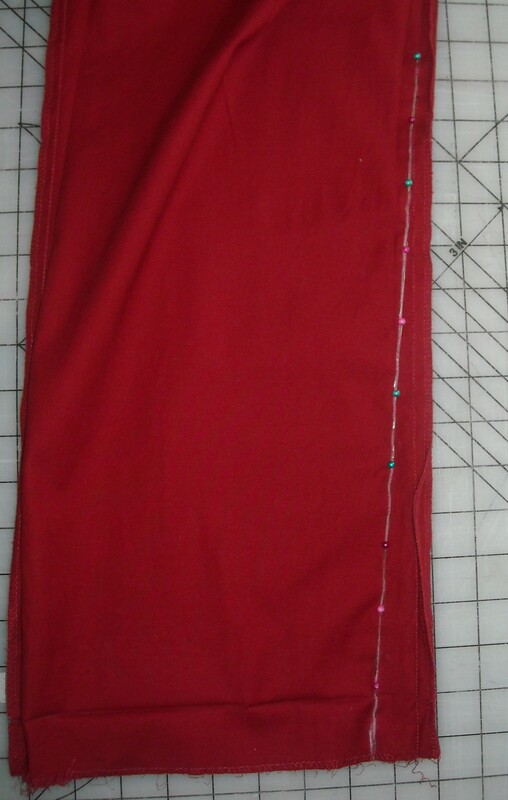 You can use a serger, or my favorite technique, stitching 1/4″ away from the seam allowances and then pinking the raw edges. After you’ve done that, press the seam open. You may have to remove some of the seam stitching on the pants (like I had to) if it overlaps with the seam allowance and gets in your way of pressing the seam open. 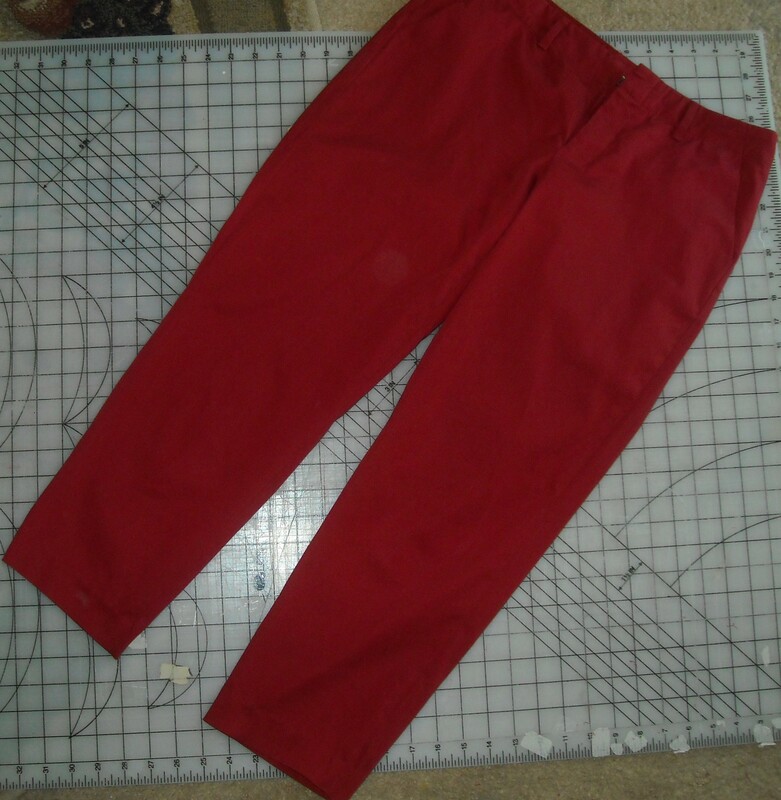 Finally, hem the pants! I liked where the original hem was, and there was already a prominent crease there, which made hemming oh-so-easy, but if you want your pants longer or shorter, now’s the time to change that. 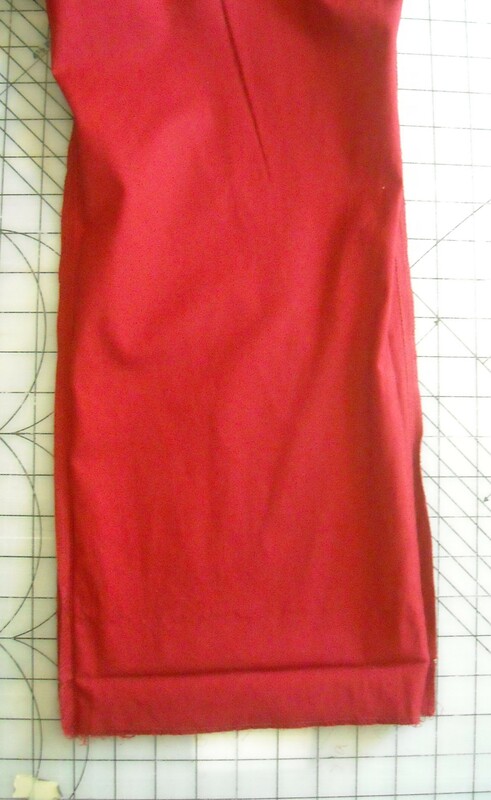 After hemming, turn right-side-out and press. I love 50s trousers! Thanks for this! Dont have to buy any repro ones now. 🙂 I can make my own! Anna, I sew vicariously through your blog. Yay, so cute! Love these!